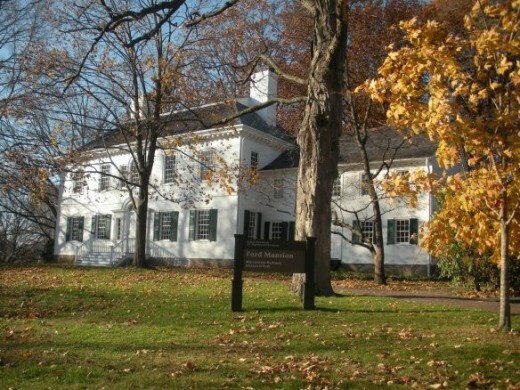 Washington's Revolutionary War Headquarters Becomes the First National Historical Park! 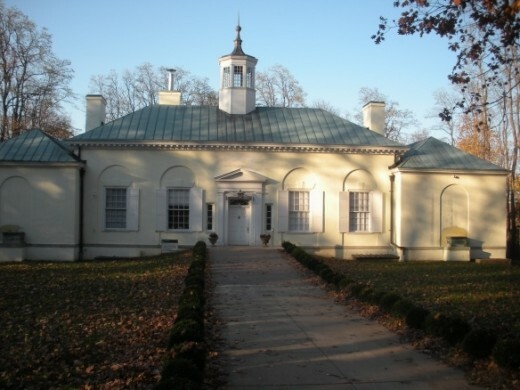 The Ford Mansion in Morristown, New Jersey, served as George Washington's Revolutionary War headquarters during the winter of 1779-1780, close enough to New York City to muster against the British enemy yet protected by the Watchung Mountains. 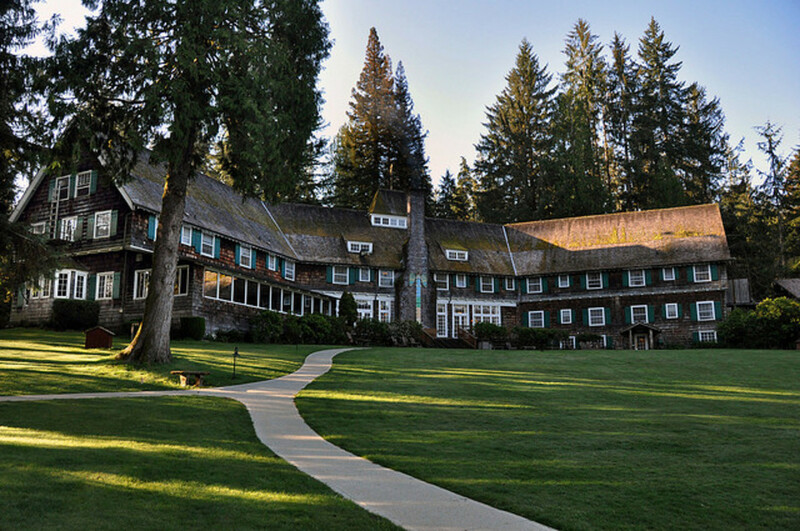 In 1933, the federal government expanded the role of the National Park Service to include historical sites, and the mansion became part of the country's first national historical park. The Morristown National Historical Park consists of the mansion, a museum and library, nearby Fort Nonsense, and the Jockey Hollow and New Jersey Brigade areas. On a recent weekend my family and I visited the park, touring the museum and mansion and walking about Fort Nonsense and Jockey Hollow. While we only spent an afternoon at the park, anyone who likes hiking or walking nature trails could easily spend a whole day. Martha Washington, the Ford Family, and Diplomats! The mansion, open only for guided tours, was built in the early 1770s by Jacob Ford Jr., who served as a colonel in the Revolutionary War until he died of pneumonia in 1777. When Washington arrived in Morristown in December 1779, Ford's widow, Theodosia, offered the home to the general for his headquarters. He paid rent for the winter, though the ranger who took us on the tour said the amount has been lost to history. Considered a large house at the time, it seems a bit modest in today's terms. I counted eight rooms, though there probably were some in the attic. Only one or two of the rooms were larger than a contemporary house's living room. The ranger tells us that in addition to Washington and his officers, Martha Washington and the 18 family servants stayed at the mansion, along with Mrs. Ford and her four children. And that's not counting visiting diplomats, representatives and officers from elsewhere. It was so crowded that the hallways were turned into sleeping quarters! 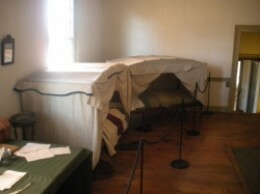 Here is a photo of the collapsible beds that Washington's officers and visiting officials and diplomats would have used. These are set up in a passageway that was turned into a bedroom/working area. Read About Washington's Winter at Morristown, New Jersey! - Great Revolutionary War Books! You can learn a lot during a visit to Washington's headquarters -- especially from the video in the museum -- but if you want more details or information about the Revolutionary War leader's time in Morristown, New Jersey, there have been several books written about that time. Here are a few that you will give you a good start. 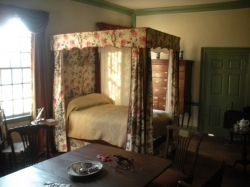 George Washington and his wife had their own room (shown here) during his stay in Morristown. While the ranger doesn't claim that Washington slept in the bed, he does say that it dates from the 1770s. The tour only takes 20 minutes or so, since the house is relatively small. The ranger is kind enough to fill the time with tidbits about the weather of 1779-1780, which was the coldest on record in New Jersey, and facts about who stayed here that winter, including the diplomat from France and Alexander Hamilton. He also explains that one of the Ford boys, possibly besotted by Washington's presence, entered the army and served admirably. All three of the Ford boys ended up going to Princeton University and becoming lawyers of distinction. Washington and his army left in June 1780 to meet the approaching British. The revolutionaries won the Battle of Connecticut Farms in present-day Union Township, and the British retreated back toward New York. The battle was the last in New Jersey, with the war shifting to the south until the Americans victory at Yorktown, Virginia, the next year ended the war. Make Sure You Watch The Video! 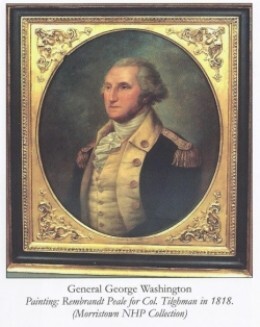 Behind the Ford Mansion is a museum housing a small but important collection of Revolutionary War-era artifacts, including the Washington portrait shown here (Taken from the National Park Service brochure because no photos are allowed in the museum). The museum consists of three main rooms. The first contains items that belonged to Washington and others of his class in the late 1770s, including a decanter, tea caddy, knife and fork said to belong to the first president. Also included are a pair of women's white slippers that are believed to be worn by Martha Washington and a piano that was played by Eleanor ''Nelly'' Custis, who was informally adopted by the Washingtons. A second room contains New Jersey-area artifacts from the Revolutionary War, including a Ferguson rifle, cannonballs, swords and bayonets. Also here is the sword that Washington probably wore at his inauguration as president in 1789. I was most impressed with a link from the Great Chain of West Point. The link, about 2 feet long and weighing more than 100 pounds, was used to help blockade the Hudson River in 1778. The revolutionaries strung more than 88 of these links together across the 600-yard-wide Hudson near West Point to prevent British ships from going upriver! The most interesting part of the museum was a video about 25 minutes long that detailed the army's stay in Morristown. The video, narrated by Edward Herrmann, is a great explanation of the ``hard winter,'' the coldest on record in New Jersey, and the way the soldiers endured. It's not surprising that at one point some starving soldiers from Pennsylvania became mutinous and had to be brought back in line! 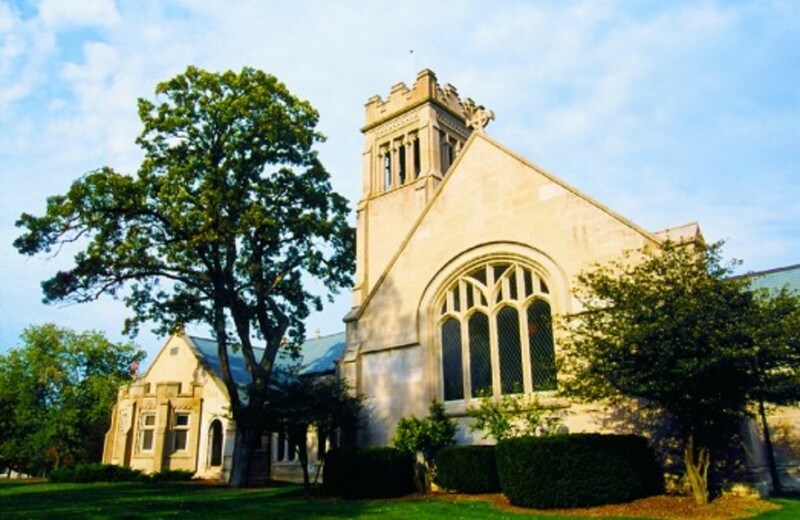 At the rear of the museum is a collection of pamphlets and manuscripts from the 18th and 19th centuries that once belonged to long-ago local resident Lloyd W. Smith. The wall plaque says the collection has over 200,000 pieces! Only a few dozen are displayed at any one time, including Thoughts on Government by John Adams (1776) and Thomas Paine's Common Sense, a reprinted pamphlet from London (1776). The only way to get to the other parts of the park is by car, so after we finished with the museum we drove to the site of Fort Nonsense. We passed through the center of Morristown, which has some great restaurants and shops, to a hill overlooking the town from the west. There's no proof that the site was known as Fort Nonsense during the winter of 1779-1780, when the fortifications were built. Legend has it the name came from the belief that the whole project was simply ''make-work'' to keep the soldiers busy that winter. 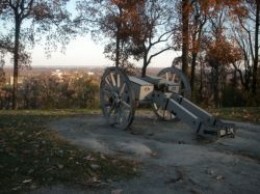 Because there's no record of what the fort looked like, the only things that are on the site are a few place markers and the cannon in this photo (with Morristown down below). We did pass several joggers on the road to the top and there are picnic tables available, so the locals probably just use the area as a park. The Jockey Hollow Encampment area is less than a 10-minute drive from Fort Nonsense. Skip the visitor center if you have been to the museum, because the only thing there that is of interest is the same video that is shown at the museum. The encampment area has more than 27 miles of trails for hiking, along with a few replica huts from the time that the revolutionary soldiers stayed there. During some weekends and the summer there are activities and re-enactors on the site, but the Autumn day we were there it was quiet except for people walking around enjoying the brisk sunny day. Also in Jockey Hollow is the Wick House, which served as the headquarters of General Arthur St. Clair that winter. 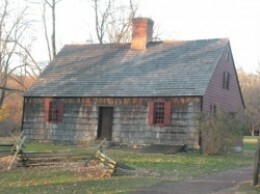 The house (shown here) is about the size of a modern Cape Cod home, but in revolutionary times it was considered a good-sized place. The ranger on hand tells me that the house -- with only four rooms plus kitchen -- was bigger than others in the area at the time, and that owner Henry Wick wasn't just a prosperous farmer with 1,400 acres of land but he served as the local bank, lending money and collecting interest! U.S. Revolutionary War, or the War of Independence! 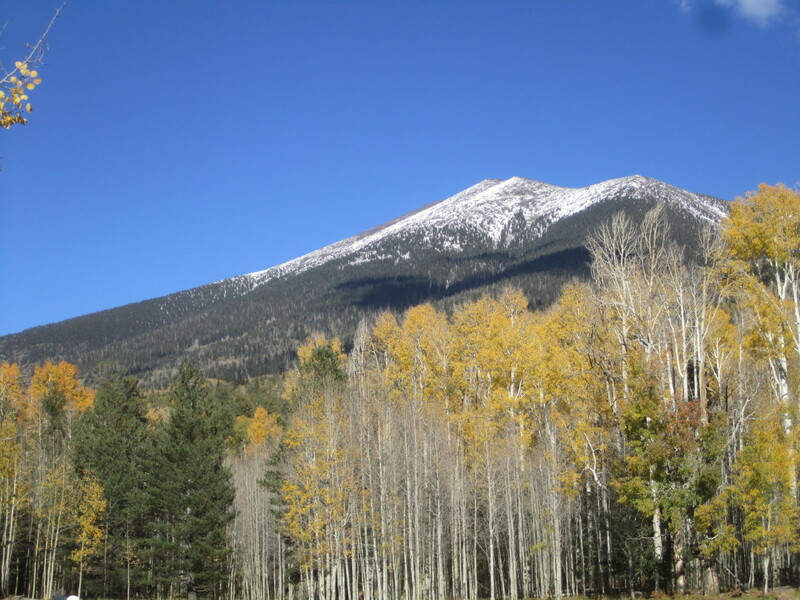 - Read About the Birth of the United States! The American Revolution had been brewing for more than a decade as the colonists grew increasingly resistant to the British Empire's taxes, while British felt the Americans weren't paying their fair share. The political hostility turned to war with the Battle of Lexington and Concord in Massachusetts, which took place April 19, 1775, in the famous ''shot heard 'round the world.'' The war continued until October 1781, when Washington, with the help of the French, defeated General Cornwallis at the Battle of Yorktown. The Revolution has been the subject of hundreds of books over the centuries, with many available on Amazon. Take your pick to read about this fascinating part of American history! Here is the official website of the National Park Service so you can get more details on when the museum, headquarters and park are open, as well as directions and other information! Have You Been To Washington's Headquarters? - The Classic New Jersey Class Trip! I am pretty sure that the first time I visited Washington's headquarters in Morristown was as a youngster on a class trip. In fact, I am almost positive I had more than one class trip to the park! Most school children in the area probably have visited, but I wonder about everyone outside the New Jersey area. Has anybody come to New Jersey to see Washington's headquarters and tour the museum (as seen in this photo)? Have you ever visited Washington's Headquarters in Morristown, New Jersey? Yes, on a school class trip! Yes, but not with school! No, but I plan to go! No, and I don't have any plans to go! Visiting Fort McHenry, Birthplace of the Star-Spangled Banner: Family Day Trip! I hope this article has provided you with some good information about the national park. Please let us know what you think of George Washington, the park, this lens or anything else! Highlights of Valley Forge National Historical Park: A Pennsylvania Family Day Trip! 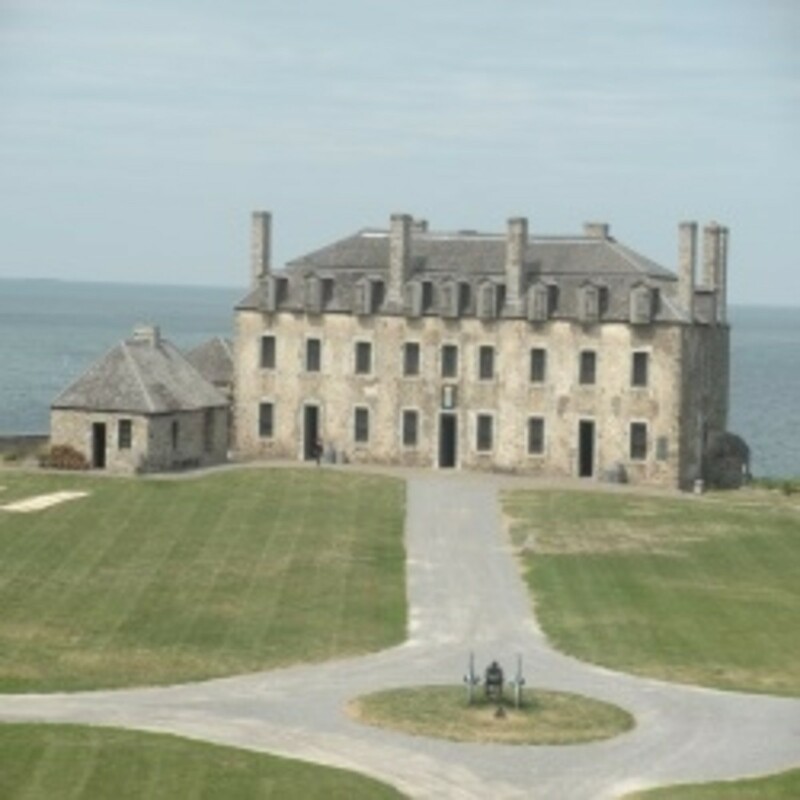 What Do You Think of George Washington's Headquarters? - Or Fort Nonsense and Jockey Hollow? I feel bad now, I spent my first 19 years in New Jersey, and have been back here for over two years now after living in California for a while, and while I've been to Mount Vernon in DC, and quite a few revolutionary war battlefields, I've never been to the George Washington headquarters. I'll have to check it out soon! Thank you for sharing your family trip to Washington's Headquarters in Morristown, New Jersey. I enjoyed tagging along and learned something new. I always enjoy lenses on field trip ideas - thanks for this well-thought out lens. Blessed by a Squid Angel! Can't believe my fellow has missed this site. He is a history nut. We have been to all the war sites and memorials around the east coast and mid west. Our trip to Valley Forge and Gettysburg were the most interesting. I guess I'll have to tell him about this one. I didn't know about any of these places. Thank you for highlighting them for us! Thanks for putting this lens together - I certainly didn't learn any of this in school. I would relish a visit to this historic place. History buffs would really enjoy it. Well presented. Love the info in this historic article. I'm in New Jersey, it's about an hour or so to visit here...we've been and my husband and son went almost yearly when he was a ranger with Christian Service Brigade. We need to go just the two of us now so we can enjoy the visit in a different way. Blessed and pinned to my places I'd like to see again. Beautiful page. Good historical Lens (a big Squid Like here, I love History); boy, George sure did get around. Great lens. I hope someday I can get to visit the East Coast and see all these wonder historical sites like this one.